The Bowflex TreadClimber TC20 is a 2012 fitness machine with three different modes- a treadmill style, a stair climber style, and an elliptical style. The machine is built like a treadmill with the tread split into two separate treads- this separation is what gives the TC20 its unique features. It runs between .5 and 4.5 miles per hour and has an electronic screen that can display speed, distance, calories burned, time in use, and the user’s heart rate. The TC20 weighs 217 pounds and has a maximum capacity of 300 pounds. The treads can be up to 17 inches off the ground, so account for that when measuring ceiling clearance. The dimensions are 55″ length by 31.5″ width by 55.25″ in height. It currently sells for $3,299.00 on Amazon. The three modes of action that allow for three separate types of exercise in one machine. This is a great time saver as well as a way to fit three machines into the space of one. The electronic tracking and console. You can set up a profile and set your own goals, then use the screen to track your progress. You can track useful statistics and take control of your workout. The design is comfortable. You can store water bottles and other accessories for your convenience. The Treadclimber TC20 comes with a three year warranty, the longest warranty that Bowflex offers on its machines. The TC20 is a top of the line machine. It has more features and a better built quality than the TC5 or TC10 Treadclimbers. The TC20 is suitable for serious home use, and its full feature set gives it the tools to accomplish that role. The price. Although it is understandable that you need to pay for quality, when you reach the three thousand dollar range, it becomes harder to justify buying the machine. Compare the price of the Treadclimber to joining your local gym. If you are really committed to working out, a gym membership might well be less expensive and give you access to a wider array of machines. The advantage of the TC20 is the convenience. The readings may not be accurate. It is difficult at best for machines to measure how many calories the user really burns during the course of a workout, but the TC20’s figures do seem inflated. It won’t do any harm if you stick to a set workout and pay attention to the distance and time, so long as you do not place too much trust in the “calories burned” report. Overall, the TC20 is a strong contender for a high end in-home workout machine. If the price tag is not a large deterrence, you won’t find a better machine in its class. 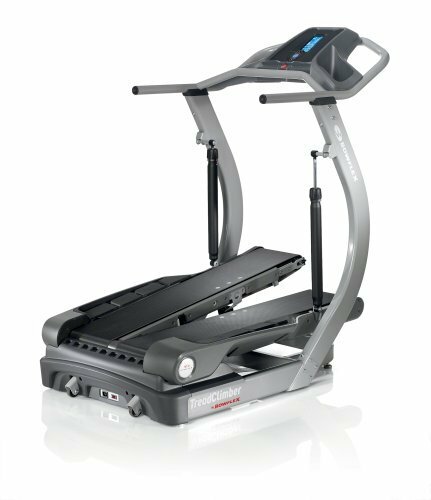 Other incline trainers, like the Freemotion and Sole Fitness E95, lack the three modalities of the TC20. They are lower in price, but the greater value of the TC20 makes it a good deal despite the larger price. For those who want the best in home workout equipment, the TC20 fits the bill admirably. It even comes with a weight loss plan from Bowflex, although of course you may design your own plan to suit your needs. The personalizable software makes that an easy task. Be prepared for some assembly when ordering the TC20. It might be a good idea to order it from an outlet that provides delivery and assembly, if you feel that the job of putting it together might be a problem. In short, the TC20 is a leading competitor in the high end home fitness market. For those with the money and the space, it is hard to find a better deal.